This archival footage of the 1919 World Series was reported to be among a trove of newsreels from the Canadian Yukon that were at one point used to fill in a swimming pool that was being converted into a hockey rink (recycling is the Canadian way after all). Archived with the rest of the reels in 1978, this footage was discovered by a White Sox fan (imagine the odds that one of 17 people found this) working on a documentary about the lost films. Among the remarkable footage you can see players, coaches, Black Sox ace Eddie Cicotte infamously letting in five runs in the fourth inning of the opening tilt that chased him from the game (as Deadspin pointed out, he doesn't look to be playing his position all-too-well on most of these hits), and probably the coolest thing, footage of a huge crowd gathered in New York City to “watch” the action via a mechanical scoreboard whose operator received the results by telegraph from Cincinnati. 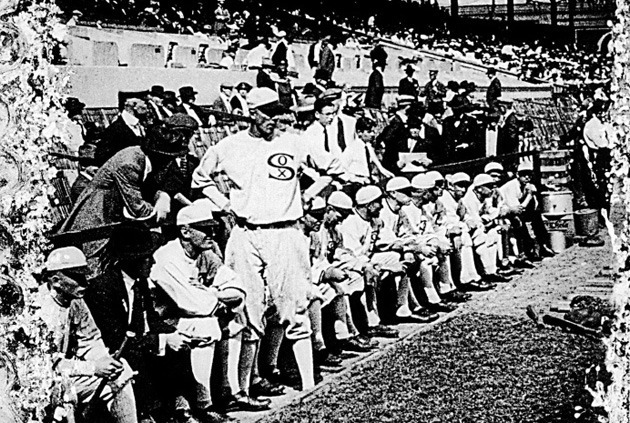 Despite all of that info, it remains cartain that the Black Sox was a far better team name.